The latest company to jump of the censorship bandwagon is Harley-Davidson. In a statement released yesterday, the company has officially banned its dealers from selling t-shirts with the Confederate battle flag on them. 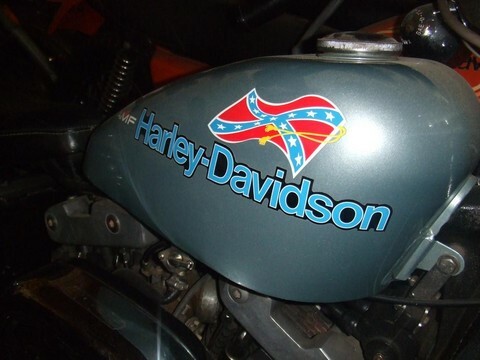 “It’s been our longstanding approach that the Confederate flag may not be used by the company, its licensees or its dealers in connection with the Harley-Davidson trademark or logo, on any products, signs or other materials,” the statement reads. “We have, over time, made a very few, short-term exceptions in which the Confederate flag appeared in a design with the Harley-Davidson brand. These exceptions were primarily in the historical context, understanding that for some of our customers and dealers, the Confederate flag represents a very rich and proud heritage. These designs were reviewed on a case- by-case basis (for example, there was a small group of designs approved to commemorate the 150th anniversary of the Civil War and were primarily available at dealerships near battleground sites). Some dealers are upset about this recent action. In Union City, Tennessee, Russell Abernathy, who owns Abernathy’s Harley-Davidson dealership, posted on Facebook, and his comments quickly went viral. In 1977, Harley-Davidson released a Confederate Special Edition model with the battle flag painted on the gas tank. Those were the good ole days!